This is the connection with the redemption and miracle of 12 Tammuz [when the Previous Rebbe was miraculously released from prison], for it is known that G–d relates to the world in two ways: through nature and through miracles. From the perspective of Seder Hishtalshelus [the orderly chain of the spiritual worlds], the natural and the miraculous are removed from each other. This is the reason that one who recites Hallel daily is considered a blasphemer, for miraculous divine behavior, on account of which one recites Hallel, is contrary to the standard natural manner in which G–d treats the world. However, this is only from the perspective of Seder Hishtalshelus, which stems from divine strictness, for our Sages say that the world was created through the attribute of judgment. However, G–d then saw that the world couldn’t last, so he partnered the attribute of compassion along with the attribute of judgment. The Alter Rebbe explains in Tanya that this divine compassion is expressed through “the revelation of G–dliness by Tzaddikim and signs and miracles.” This is the idea of abolishing the partition and division between the natural and the miraculous, such that even in nature, miracles are elicited in an open fashion. These miracles infuse the Jewish people with strength in serving G–d, enabling them to abolish the partition between mundane matters and Torah and prayer, such that the light of one’s Torah and prayer shines even in one’s mundane matters. This reaches the point that they reveal G–dliness even in physical objects, as it is written, “The glory of G–d will be revealed and together all flesh will see that the mouth of G–d has spoken.” This means that the flesh itself will perceive G–dliness, just as the Neshama sees G–dliness before it is vested in a body, and to an even greater extent. See Ohr HaTorah, Bereishis, 18b. Rashi on Bereishis 1:1. Bereishis Rabba 12:15. Shaar HaYichud Veha’Emunah ch. 5. I.e., when the Previous Rebbe was miraculously released from Soviet imprisonment, inspiring Jewry to overcome the challenges that they faced in Jewish observance under communist rule. Sefer HaMa’amarim 5717-5718-5719, p. 470. 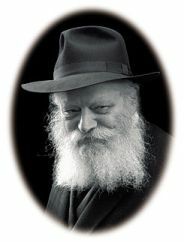 In my own words: When the Tzaddik performs miracles and suspends the division between the natural and the miraculous, he grants the Jewish people the ability to transcend the natural divisions in their personal lives, such that one’s inspired state while engaged in Torah study and prayer continues the entire day. I’ve translated the whole of this letter of the Rebbe because although some of it is not so relevant to the blog topic, it’s needed in order to know the context of the section that is relevant. The lack of obedience in Kfar Chabad, and the disorganization that this leads to, cause me tremendous pain. I am not sure of the solution for this, for it would appear that the solution is simply to reach a recognition, which means an internal understanding and sensation, that Kfar Chabad carries the name of Chabad, and when it was founded it received the blessing of the [Previous] Rebbe, my father-in-law, for this. It is well known that while still alive he said here, that he leads it [Kfar Chabad] himself. Thus, you must all regard all matters related to Kfar Chabad as relevant to fulfilling the desire and will of the [Previous] Rebbe, my father-in-law, and honoring his name. This is not a personal matter. In the positive sense: This is his [the Previous Rebbe’s] personal task, and he is the Nasi HaDor [Leader of the Generation]—meaning that all the flows of blessing related to our generation flow through him, and not only spiritual flows, but even physical ones. For as is known, this is the function of a Nasi—that he elicits all the flows of blessing for the generation without exception. Therefore it was necessary for even the physical meat of the generation of the desert to be elicited via Moshe Rabeinu [the Nasi of that generation]. (It is true that he said, “From where will I have meat?” [which apparently implies that he was not a conduit for that type of physicality]. However, Chassidus explains that he said, “From where will I have meat?” [This indicated that he recognized that the blessing did need to come via him, and he was only questioning how this would occur in that particular situation.]) [Thus,] one receives his flow of blessing—provided the channels used conform to his [the Previous Rebbe’s] wish and desire—successfully, i.e., in a manner that transcends the natural order, and one may then use it for healthy, happy things. In the other sense: Inappropriate behavior increases the power of the “other side” [a reference to the forces of Kelipah, i.e., concealment of G–dliness] not only in one’s own environment, but also in the environment of the Nasi HaDor. Thus, this affects the community to a far greater extent than the [general principle that] “All Jews are responsible for one another.” It is unnecessary to elaborate upon this, for the matter is sufficiently straightforward, especially for those who have been involved in the teachings of Chassidus, and have an appreciation of the notion of Hiskashrus [bonding with a Tzaddik]. Igros Kodesh, Vol. 6, p. 257. When Reb Hillel Paritcher taught the first chapter of Tanya concerning tzaddikim, beinonim, and resha’im, Reb Hillel explained what is a Rebbe, saying that a beinoni is finite, a tzaddik is infinite, and a Rebbe is the infinite within the finite.